Youth shouldn’t need to face racism when they step on the soccer field, but it’s been part of the experience for many young athletes. Spring is right around the corner, and for many kids and parents that means that soccer season is starting up again. Get ready for the smell of freshly cut grass or, if you live in a city, the cling of green turf shavings and black rubber pellets. Get ready for goal celebrations and heartbreaking losses. Get ready for superhuman parents and parents whose sideline antics make it desperately clear they are living vicariously through their children. Get ready for teenagers to again struggle with the balance of soccer, homework, studying, and more soccer. We hope that all this still leads to smiles on the field, at least most of the time. Soccer is a game, after all. For the last ten years this has been my Spring — ever since I started South Bronx United, a nonprofit youth development organization that works with student-athletes, primarily immigrant youth and first-generation Americans, from the Bronx and Northern Manhattan both in the classroom and on the soccer field. The start of the season brings excitement for all of them. After a cold winter, few things are better than that first outdoor game or practice under the sun, when you can finally shed your layers and the winter’s doldrums. Of course, the new season brings stresses for kids, parents, coaches, and administrators alike, but most of them are par for the course — not enough time, too much laundry, impossible travel logistics, rising costs, how to convince a team of adolescents to just get along… There is one thing that is likely to come up at least once this season, for at least one of our teams from the South Bronx — one thing that I will never accept. Something that has absolutely no place in youth soccer, no place in any youth sport or activity. Monkey noises, jeering, and even the N-word. Our youth have heard it all. Yes, racism is alive in youth soccer, unsubtle and out in the open. We aren’t in the stands at a lower division European football match. And we aren’t experiencing this in the Midwest or the South. This very well could be happening on the sidelines at your local park. This is happening in New York City, in its suburbs: Westchester, Long Island, New Jersey, and other places in the Northeast. This may come as news to many, but most athletes of color can identify with the experience. Over the past year, racism on the field has been a topic of discussion for a group of young leaders at South Bronx United. At one meeting, I posed the question: “How many of you have been seen, heard, or experienced racist language or behavior at one of your games?” Every hand went up, boys and girls, ages 13 to 18, and they proceeded to share their stories. I know that a teenager’s impression of racism and what constitutes racism (as opposed to generally rude, disagreeable, or combative language and behaviors) can sometimes be inflated. In fourteen years of experience as a teacher, counselor, and youth program director in the South Bronx, I have seen some young people call out as racist any response that didn’t suit them and came from a person of a different ethnicity. Often, past trauma (trauma of their own or of those close to them) leads to these conclusions, but their accusations can off-base nonetheless. But hearing from South Bronx United youth, their experiences on the soccer field check out. There is a combination of anger, incredulousness, and resign in their voice. And our coaches and I have stood through enough of them to know they weren’t exaggerating. Think about that. Most of these teenagers have experienced overt racism while playing a game. Kids are taking racial abuse on the sports field, a place where they should be able escape their stresses — stresses that, for many, include gang-threats, concerns about immigration status, unhealthy diets, and any number of challenges associated with poverty, not to mention the typical teen’s worries about school, SATs, social media, dating, and parents. The social and character benefits of youth sports can vanish in an instant. The game ceases to be a game. The lesson is no longer about what move to make when you approach a defender, what shooting technique to use in what position, how to defend a free-kick, or what strategy will best help your team recover from a two-goal deficit. The lesson becomes how to navigate in a world where hate is directed at you from people you don’t even know, who judge you merely by the combination of your appearance and the fact that you are playing for the wrong team. The lesson becomes what to do as a black or brown young man or woman when you set foot in a homogeneous, usually white, neighborhood or playing ground. The lesson becomes what do you do when the adults around you neglect their responsibility to ensure safe settings for children, and even become the ones creating the problem. “Here, the white boys have more power than you black boys.” Those were the words uttered toward a 15-year-old teenager last year. The implication: as a black boy, he better watch his step. The boy was standing on the sideline watching his younger brother play. His brother was 11-years-old. Those words came from a representative of the opposing team, from the mouth of a parent. Several parents exhibited an attitude of white supremacy throughout the game, one that also manifested into referee abuse. The scene was disturbing enough that the referee called me after the match to share the situation. Throughout the sixty minutes of play, none of the children had issues with each other beyond the typical spats of any close athletic match. The children wanted to win, but for the most part they were just happy to be on the field. On the other hand, the parents in the name of victory went out of their way to denigrate an opponent who didn’t look like them, a young boy and his brother. This was far from the first case of racism we’ve seen directed by parents and fans on the youth soccer field. We have also seen players use racist language and behaviors towards each other on occasion, but those incidents are rare and usually occur with young adults of at least 18 years old. The majority of racist language and behavior we’ve experienced has come from parents. It infuriates me when adult problems get in the way of kids learning and joy, whether in education or in youth sports. Parents behaving badly at youth sporting events is nothing new or particularly uncommon. A quick Google or YouTube search will provide some outrageous examples. These can be damaging to the sport, to the team, to the kids around them, and most of all to their own child. The child of the unruly parent probably isn’t enjoying himself or herself and probably won’t be playing much longer. Racism and xenophobia on the field escalates these antics to another level altogether. We can expect that many parents harbor their own prejudices. Yet, the rate at which parents proactively infuse hateful language into a game is astounding. Racism targets specific children and their families and can cause irreparable damage. It endangers their safety and potentially the safety of everyone on the field. As much as we counsel youth on ways to take the high road, racially inflammatory language and behavior triggers emotions that in turn can lead to violence and brawls. “Go back to where you came from!” The words trailed the girls as they left the field. These words weren’t referring to the Bronx. They had just finished a soccer game at a serene grass field in northern Westchester County, bordering New York City, via the Bronx, and Connecticut. Sometimes the trips can provide a respite from the bustling, loud city neighborhoods the girls reside in, but not on this visit. They had driven past a fair share of Trump campaign signs on their way up. That parents, fans, and young people feel licensed to exhibit hateful language and behavior is representative of a larger problem. In the past two years, the negative attitudes towards immigrants or those who fit certain profiles — particularly Muslims and people of Hispanic descent who may have been here for generations — have seen an unmistakable increase. The vast majority of people in this part of the country are sympathetic and supportive of youth and families who have come from other countries often to seek a better life and escape poverty and violence. However, there is a substantial portion who do harbor ill will. The continually escalating attacks on immigrants from an outspoken section of the political spectrum and from the federal government itself has taken its toll. At South Bronx United, young Latinos and Latinas especially have witnessed xenophobia even on the soccer field. Hate crimes and instances of racism overall have been on the rise since Trump made racially inflammatory language a hallmark of his candidacy. (It is worth noting that antisemitism, which deserves a separate story entirely, has also shown an especially troubling rise.) I don’t have the data, but it is likely that racist language and gestures are also growing at schools and youth events. Given this, it would be easy to mark these incidents off as a red state or red county problem or blame it all on the Trump Effect, but based on our own experiences the problem goes far beyond political boundaries. Racism on the youth soccer field was around well before 2016. Racism has simply become more public since Trump. This should not be surprising. School segregation is at extreme levels in many cities and communities — New York City leads the way. White families and white children interact socially in all-white environments. Even in the nation’s most diverse city, most interactions between people of different racial and socioeconomic backgrounds are only transactional in nature. When people go to school, work with, and interact socially only with others from their same race, they will struggle to overcome stereotypes and prejudices against those from other backgrounds. The result is less mutual understanding and less empathy. This level of segregation is not going to simply disappear when Trump leaves office. This brings us back to the youth soccer field. It might strike people as strange that people’s racist tendencies are being unmasked on the youth soccer pitch so frequently. Why is this happening? I think there are several factors at work. First off, any team sport will be more prone to conflict. Every game, there are thousands of interactions between players, often involving physical contact. By definition, team sports fosters an us versus them mentality. Throw in the expectation of loud and perhaps even obnoxious fan or parent involvement. Picture your caricature of the unruly parent. I think of Will Ferrell’s character in Kicking and Screaming. This person is on the sideline of a team sporting event, not in the stands of the tennis court, swimming pool, track meet, or golf course. Even among team sports though, soccer has several specific characteristics that may make it more prone to racism. Soccer has a large reach, among the largest youth sports in America for decades now reaching millions of children each year. Soccer fills local parks, large multiplexes, and urban turf fields after school, evenings, and weekends in cities, suburbs, and rural towns. These characteristics make the youth soccer field a potentially ripe venue for interaction between various groups. It can bring together young people from various races, religious persuasions, and backgrounds in large numbers. White, black, and brown children, European transplants, immigrant and first-generation youth, wealthy children and low-income youth all take up the game. However, this diversity is not evenly sprinkled across every team. It is common for teams to be ethnically homogeneous within a league comprised of teams that collectively seem diverse. Growing up in San Francisco, I remember my mostly-white soccer team playing games during our off-season against entirely Latino teams from the Mission League. In New York, various ethnic communities — Mexican, Argentinian, Caribbean, Russian, Chinese — often have a league of their own and then compete against each other in larger geographically organized leagues. At both the youth and adult level, this does not always create a harmonious melting pot. When different groups meet in a competitive, high-stakes environment… where parents forget that they should be setting the example… when zero time is put in upfront to build bridges between groups that look different, have drastically disparate life backgrounds and outlooks, and may already harbor stereotypes or traumatic experiences related to race… it is a minor miracle that conflict does not arise more frequently. One could also argue that in soccer, since no one racial or ethnic group here is most athletically dominant, games are more prone to conflict. The primarily white team and the predominantly black or Latinx team are just as likely to win any given match, on average. The games between them are more frequently competitive. Contrast that with basketball, which may have diversity, but the top teams and players are at least perceived to be urban and African-American. If you know you are about to lose or even be demolished on the court, your taunts and insults are going to be more subdued, to say the least. Despite the tremendous diversity within the game, the gatekeepers of the sport are also overwhelmingly white. This has largely been the case at local, state, national, and international levels of soccer. This homogeneity at the most senior levels of the sport has certainly been a contributor, along with the tradition of fandoms and hooliganism, to the shocking frequency of overt racism in professional soccer, by which I am primarily referring international football. If we are looking for a model of fan behavior for our parents, international football is not the place to look. Racism, primarily rooted in the stands, has been an ongoing and undeniable problem internationally, and one that has become more public in the past decade. Former American World Cup player Oguchi Onyewu’s filing a lawsuit to address racial abuse in Belgium in 2009; An anti-racism campaign “Somos todos macacos” (“We are all monkeys”) from Brazilian soccer superstars Neymar and Dani Alves; Ronaldinho’s comments on racism experienced while playing in Mexico. Ongoing racist abuse across Europe has been shared just in the past few months by Raheem Sterling of Manchester City in the English Premier League and Kalidou Koulibaly at Napoli in Italy’s Serie A. In that same recent period, banana peels were thrown at black players in Tottenham, England, and Motherwell, Scotland. The Guardian documented instances, far from exhaustive, of racism in every top European league last year. And it only tracks examples of clear racist abuse, without even touching on issues of systematic racism, the lack of black managers and executives, media bias, or the exploitation of young African players. The fact is that racism is rooted in many Latin American societies, as well. Central and South American countries might appear to be multi-ethnic and inclusive on the surface— think of the racial diversity in Brazil, the darker skin tones of populations in Peru and Bolivia, or the fact that 40 percent of Latin American population is considered indigenous — but racism is the result of many of the same factors that are seen in the United States and Europe. Afro-descendant and Indigenous people occupy the lowest rungs on the income, educational and occupational ladders across Latin America. Heads of state are almost uniformly white. People internalize this societal structure, and their racist leanings are left unchallenged by the homogeneity of their immediate neighborhood and social circle. Take it a few steps further and you can see where the racist chants at soccer stadiums from Mexico to Brazil to Argentina come from. And you can see how transplants to the United States can view this abhorrent behavior as similarly acceptable. You can see that we need to be fighting racism in all directions. Although we rarely hear racist chants at stadiums in the United States, every American needs to realize that racism still happens in their own backyards. I don’t suggest that youth soccer better reflects the state of our divided country or the degree of racism in America than anywhere else, but we need to recognize it as incredibly distressing. How can we expect to create a more inclusive society for future generations if the very institutions that our children grow up in are infected by racism, driven by the adults no less? There is a flip side to this coin. Youth sports, a place that inhabits the daily lives of most parents, has the power to bring people together in combating racism and xenophobia as much as it can allow it to fester. Generations of examples have shown that sports can build bridges and help people overcome their biases. When it is done right, sports can provide the solution rather the problem. Ensuring that youth sports programs do not perpetuate the level of segregation seen in many schools is a good first step. We should at least question a team that is all white but also a team with just one or two kids of color as true diversity, especially when they are not reflective of the city’s or region’s demographic makeup. Don’t let the acceptance of a few students of color or a few religious minorities masquerade as diversity. This can become tokenism — where one or two minorities are taken to represent a group as a whole — and it can lead to racism against those individuals while providing no guard against racism towards opponents. Youth hockey has seen a spate of cases of racism against young black players, who are few and far between. Years ago South Bronx United teams faced racist language from white parents in Connecticut, whose own team fielded an African-American player. Programs should be responsible for bringing in youth and families from a variety of backgrounds, racial, ethnic, and socioeconomic. South Bronx United’s programs take a step in that direction reaching approximately 1,100 children and youth each year, of which approximately two-thirds are Hispanic and one-third are African-American, African immigrant, and Caribbean-American. Youth and parents come from more than 30 different nationalities and are of a number of faiths — Muslim, Catholic, Christian, and more. This diversity fosters cooperation between individuals of different backgrounds and allows for us to celebrate those differences. Increasing a program’s diversity is not simple, but steps include decreasing costs, providing fees on a sliding scale based on income (not solely “scholarships”), recruiting from diverse communities, arranging transportation for families that need it, and hiring culturally diverse and sensitive staff and volunteers all can have a tremendous difference. Of course, even with diversity, there need to be steps beyond just rolling the ball onto the field. It takes an education, a mission, an awareness. Not just for the kids, but for the adults, too. Organizations and adults involved need to set up the structures to prevent discrimination and racism. First, athletic programs may need to revisit how their own values creates a negative culture. Emphasizing fun and development over winning are crucial. At minimum, sports programs need to set clear parent expectations: have parents and guardians sign contracts outlining acceptable behavior, and detail the consequences when parents don’t meet those expectations. Educate the adults on all the benefits that a diverse team can bring, all the detriments of over-parenting, and give them tools on how to speak out against racism. Often, the best way to reach the parents is through the kids. Youth need to learn to be responsible, ethical individuals who can succeed in a multicultural sport and multicultural society. A kid will have a much harder time succeeding at the high school, college, or professional level if they don’t learn to respect and collaborate with people who are different. Then, teach the children and teens teach their own parents. Programs that lack the expertise to take such steps themselves need to seek out resources. One preventative step comes to mind that makes a big difference and is simple to implement but doesn’t happen nearly enough. Help players and parents see that everyone is on the same side and that their opponents as friends who can teach them something, not enemies. Some of my most memorable games on the youth soccer field have started with two teams, usually from very different backgrounds, shaking hands, having conversation, and taking photos before the match even kicks off. We’ve done it with visiting teams from England, almost exclusively white; with a team of primarily African and Asian refugees from New Hampshire; with our friends from local youth soccer clubs whose players tend to come from the upper (and whiter) ends of Manhattan wealth. Build relationships and learn from each other. Maybe the parents could even do the same! On an individual level, parents and all caring adults need to be vigilant. The well-being of our young athletes should motivate us to act. Parents need to keep their eyes and ears open for cases of abuse within their teams and clubs and those of opponents. Speak up when a case arises. Speak to the perpetrator. Tell them that their language and behavior is destructive to your child and to others. Speak to the victims and let them know that the abusive parents don’t speak for the team. We need to build healthier, more inclusive society, and we need to continue mending centuries of divides in this country. It needs to start with the next generation, the future, but our young people can’t do it alone. They need an environment that is safe, free of prejudice, xenophobia, and racism. The soccer pitch is a good place to start. 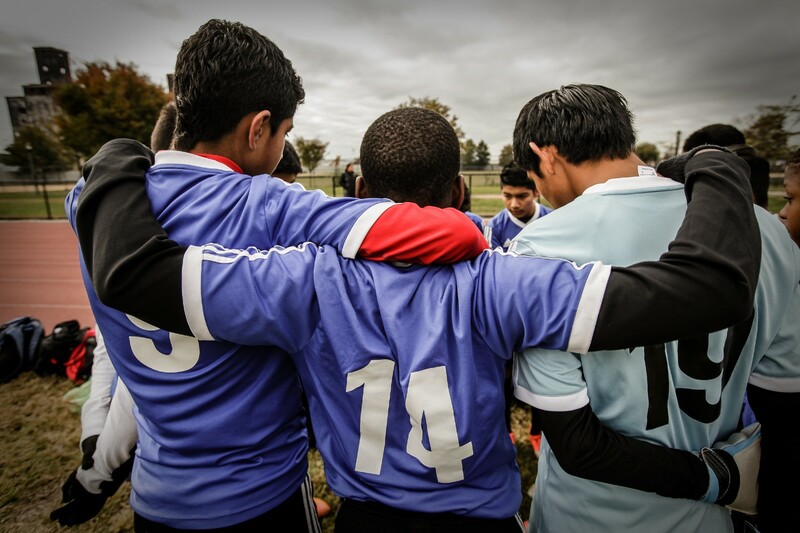 Update (April 6, 2018): In response to the article, the Cosmopolitan Junior Soccer League and the Cosmopolitan Soccer League, two of the oldest youth and adult soccer leagues in the country instituted a #StandAgainstRacism day on April 13–14th. We hope that other youth sports leagues and programs follow suit and take this issue seriously.